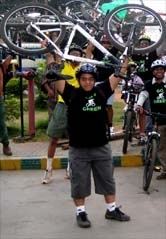 GoGreen Jersey Ordering form - GGI-Group size: 4000+ Professionals, Increasing on day to day basis, Come & join us 2 serve Mother Nature. 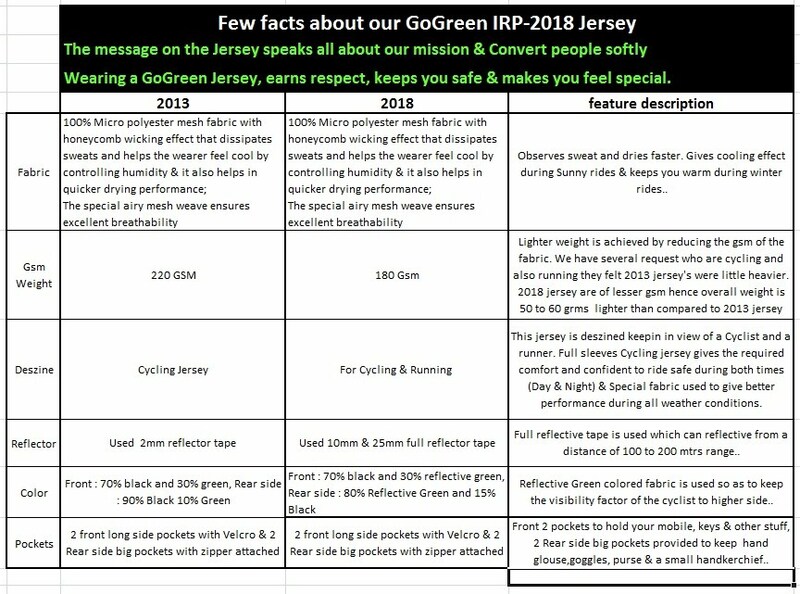 About Fabric: An special fabric that has been used which is made up of 100% Micro polyester mesh fabric with honeycomb wicking effect that dissipates sweats and helps the wearer feel cool by controlling humidity & it also helps in quicker drying performance, The special airy mesh weave ensures excellent breath ability, GoGreen jersey keeps rider cool during summer and warm in winter. About color: The main fabric is of Black fabric however we have opted for a special florescent Green color so as to make the rider visible during all conditions. 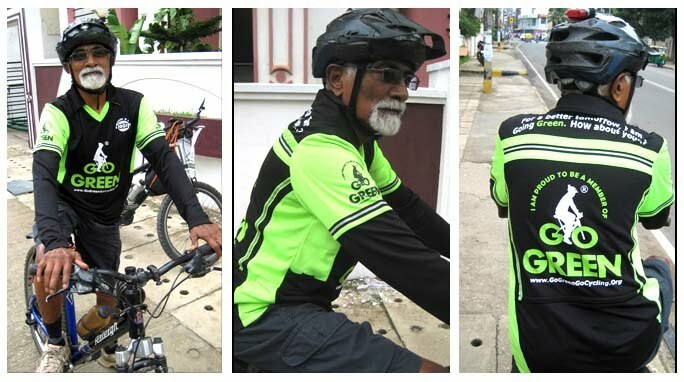 About Safety: All GoGreen Jersey have reflective tapes specially 3 tapes in the back side and 2 tapes on both the arms.. 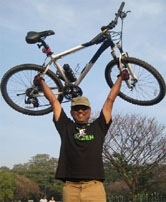 This not only keeps you safe in the night times but also enhances the deszine aspects..
All in all, We have put all our efforts to make your ride more enjoyable and at the same time make you little safe + also creating awareness while we cycling with these jersey. 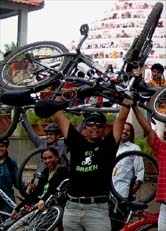 Be proud to wear this jersey while you cycle as this will not be available to any non cyclists + be proud to be part of GoGreen family..
to go for Hand wash & Strictly avoid machine wash..
Pls specify u'r Full Name along with intials in the Bank Narration. 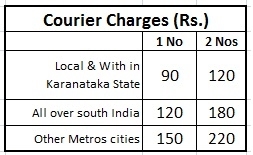 2) Give us 4 working day's to courier you'r Jersey. 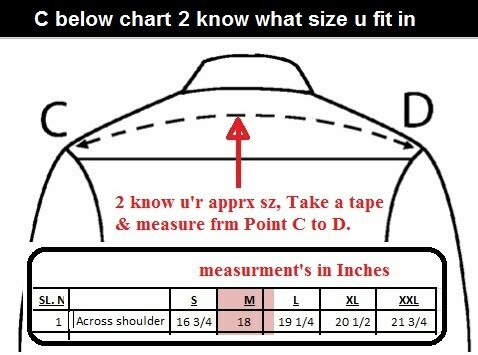 3) Once u read/copy the above instructions, Pls go below and fill up u'r GGI-Jersey Order Form. 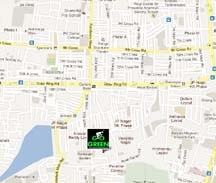 If you want to come down, personally & collect the Jersey then following is the address..
You can drop on my below message and collect your jersey, all it would need is a just a phone call on my mobile 98450 65950 so that we can confirm on the timings..